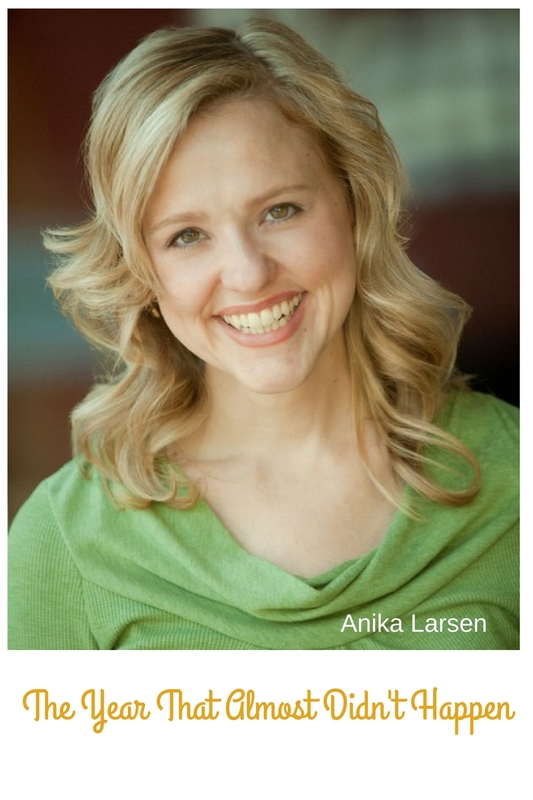 When my mom died, Anika Larsen was the first to volunteer to make the drive from Alabama to Los Angeles with me. We went Zydeko dancing in Louisiana, rode horses in New Mexico, and played the slots in Vegas. Anika read The Tale of Desperaux to me as we drove. If you're going to have someone read a book to you while you drive cross-country in mourning, I highly recommend a Tony-nominated actress. Here's the story of her remarkable 40th year that almost didn't happen. I almost didn’t make it to 40. It turned out to be the best year of my life, but I almost didn’t live to see it. I should back up. The summer I was 39 was the low point of my life. I had just gone through a break-up, I hadn’t had much work for a couple years, I’d been making poverty level wages, and I was despairing of ever having children. I decided I couldn’t do it anymore. I would quit show business, get a normal people job where I didn’t have to worry about my next paycheck or my health insurance, and have a baby on my own. 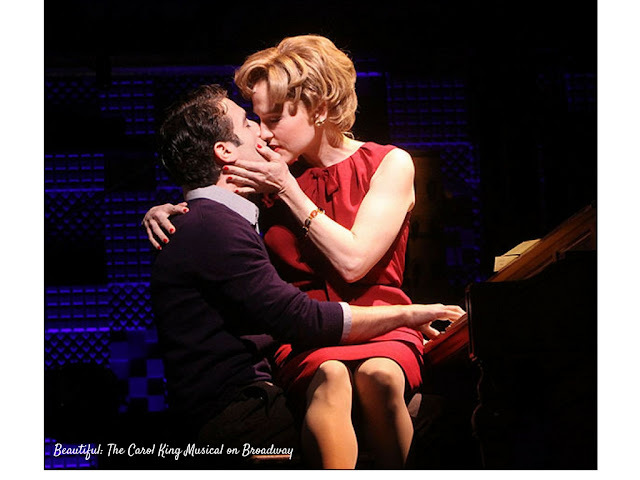 Literally the day after I made that decision, my agent called to say I had booked the role of Cynthia Weil in Beautiful: The Carole King Musical, which was going to Broadway. By the end of the summer I was in the first day of rehearsals for our out-of-town tryout in San Francisco. But when I woke up from surgery I thought, “Bump that! I am fighting for this thing!” Eight days later I was back in rehearsal—10 pounds lighter, trying to hide how weak I was, perpetually on the verge of fainting, but determined. I had the last staple removed from my belly the day before we flew to San Francisco. My 40th year unfolded in a magical, golden way. The creative team of Beautiful was generous and collaborative, allowing us to really speak into our parts. We were all so excited about the show we were making and the feedback we were getting. At curtain call on opening night in January I bowed with eyes full of tears. I was not only grateful to be able to take such pride in this role I had created, but to simply be alive. Awards season followed, and along with parties, luncheons and press events in borrowed fancy dresses came a Tony nomination and a Drama Desk award. But more important was an offer from my dresser—who had apparently heard me lament the state of my lovelife one too many times—to set me up on a blind date with a trumpet player named Freddie. The day we recorded the Beautiful original cast album I went from the recording studio straight to BB King’s, where I watched this Freddie play and I melted. Afterwards, he met me at the bar, cracked a joke, and we had the best blind date of either of our lives. Three months later I moved in with him. By summer I felt everyday like my cup ranneth over. Beautiful was a hit, I had that thing that is so elusive in show business, job security, and I was in love. Then, just after the curtain came down on a Wednesday matinee in July, there was a knock on my dressing room door. It was two of my sisters. They should’ve been at work and should not have been backstage, so I knew something was terribly wrong even before I opened the door to find them sobbing. They told me our brother Peik had died. He had a wife, two 4-year-old twin boys and a baby on the way. It was so sudden, so unexpected, so unfathomable. I went away on bereavement leave and before I came back I wrote an email to the company of Beautiful about my brother’s death. I explained that it was easier for me to tell them the details this way because I couldn’t talk about it without crying and I wore too much eyeliner in the show to be able to discuss it at work. Jarrod Spector, my husband in the show, wrote back, “Don’t worry, honey, it’ll be nothing but sunshine and roses when you return to us.” And sure enough, the day I got back, instead of asking how I was or how my family was doing, everyone kept offering me fun facts about sunshine and roses. “Did you know that it takes 8 minutes for sunlight to reach the earth?” “Did you know there’s a rose in Germany that’s a thousand years old?” I was overwhelmed by the love I felt from these lovely people, and felt so lucky that I got to make a musical with them everyday. One morning in October, I peed on a stick and got a plus sign. I ran into the bedroom to wake Freddie and tell him, and we were giddy with joy. We decided that, whether we had a boy or a girl, we would name the baby Kie for my brother, Peik’s name backwards without the P.
On December 19th, my 41st birthday, I took a personal day from Beautiful, and Freddie and I threw a holiday party. He invited his musician friends, and they jammed all night. As I sat surveying the crowd of people I loved enjoying the music of the man I loved, my baby bump just starting to show itself, I realized that even though the worst thing that ever happened to me had occurred in the past year, it was still somehow the best year of my life. All of my problems had been solved: finances, career, marriage, children. Peik’s sudden death and my own brush with death made real and close an idea we often toss around casually: the importance of reveling in today, since we sure don’t know what tomorrow will bring. Now I’m 42, the age my brother was when he died. I look around at the life I began at 40, the home and the husband and the son and now the second son cookin’ in my womb, and I am endlessly grateful. I’m not in a show right now; my audiences these days are much smaller. As I lie cuddling my toddler before his nap, feeling my other baby boy kick in my belly, I sing the lullabies my son demands and I think, “I still got it!” Well, maybe not 8 inches of my colon, but everything else that matters. To learn more about Anika and her work visit her website. You can also download her album here.